Today was an interesting day. Caleb was not at all in the mood for the paparazzi today. He wasn’t much in the mood for anything today, actually…even delicious cheesecake. However, it was my birthday, so I was determined to have some fun – whether he was up for it or not. My mom and I started a tradition several years ago (when we were working at the same place) of going out for a birthday lunch every year. Since our birthdays are only four days apart, it was kind of our special thing. The last two years Caleb has also joined us, which is fun since he is also a February baby. Today was the day for that celebration, so we met up for lunch at The Cheesecake Factory. I always feel a little silly toting my big camera around when I’m out and about, but I made myself do it today. I shot with both my Canon and my iphone, and honestly, the iphone photos were my favorites so I’m including several of them today. Caleb pretty much wanted nothing to do with his food and would only eat the whipped cream on the cheesecake. Sometimes I really wonder where this kid came from. I caved and gave him my ipad so I could sit and enjoy my meal. 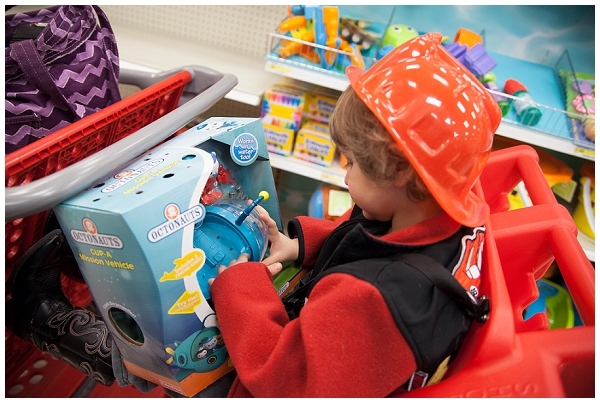 After lunch, Caleb had a gift card to spend at Target so we headed over there where he picked out a new Octonauts toy and a fireman hat (or “whee-whoo” hat, as he calls it). He was quite proud of his purchases. Apparently that was enough to tucker him out and he crashed as soon as he hit the car seat. He spent the rest of the afternoon on the couch snoozing away while I got to enjoy some peace and quiet.